Is winter leaving you chilled? 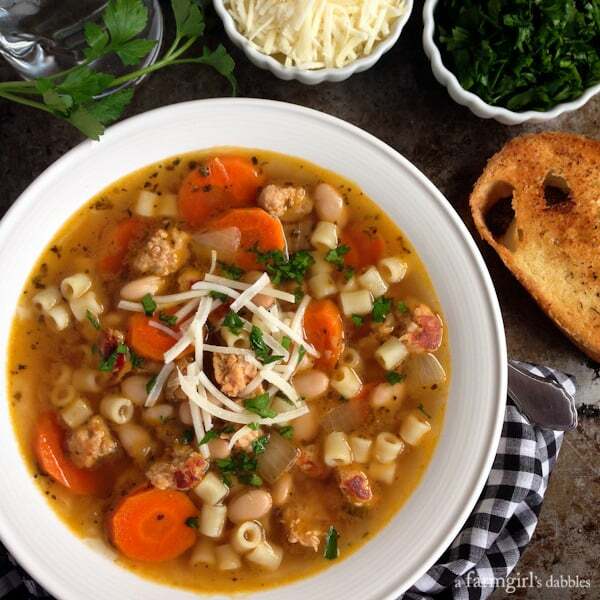 Set a pot of this Italian Chicken Sausage Soup with White Beans on the stove and let it warm you up. Winter came early this year to the Midwest, and it’s not messing around. It feels like some kind of cruel joke to already have had several snowfalls and a couple weeks of donning our fleece hats, gloves, and warm-your-toes Sorels – especially knowing that it’s not even Thanksgiving yet. After enduring the wrath of last year’s extremely cold temps, I’m just not ready to go through this all again so soon! But, adapt, we will. We’ll let the fireplace and long hot baths dispel our chills, after shoveling the driveway and sledding down hills. There’ll be pots of coffee. And small hands wrapped around mugs of hot chocolate brimming with marshmallows, too many to count. And soup. There will be many bowls of steaming, fragrant, delicious soup. 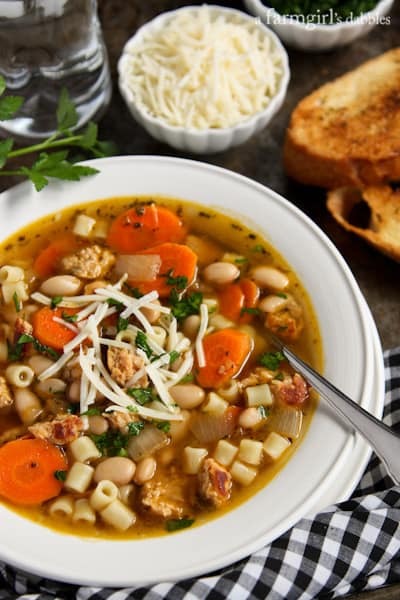 Won’t you join me in toasting some buttery garlic bread and putting a pot of this Italian Chicken Sausage Soup with White Beans on the stove? My goal when creating this recipe was to end up with a beautiful pot of Italian wedding-esque soup. A soup so irresistible that my husband would return to the simmering pot without thinking, to ladle second and third helpings into his bowl. He’s a soup man, through and through. 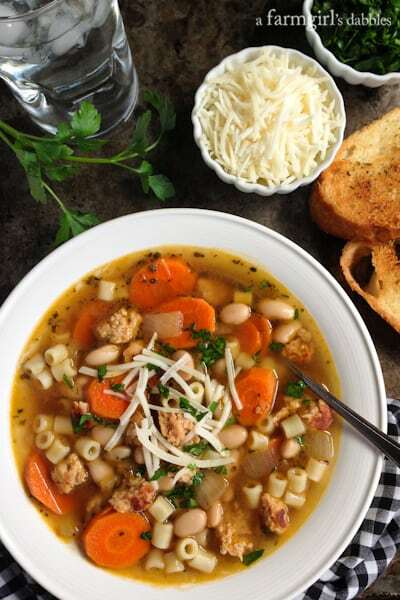 This soup gets most of its texture and flavor from Gold’n Plump Parmesan Italian Chicken Sausage. 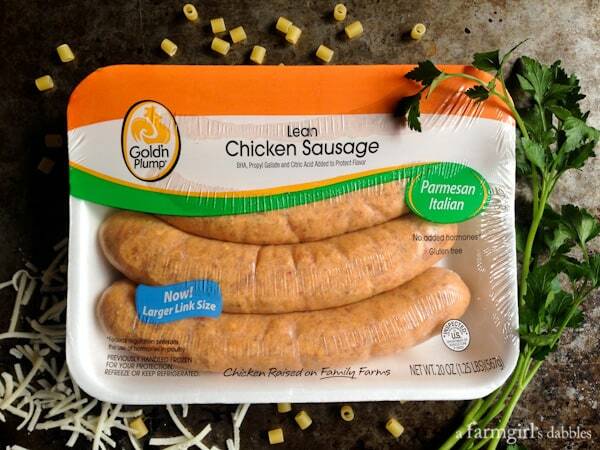 The chicken sausage is wonderfully flavored with Italian herbs and Parmesan cheese. It’s super lean and incredibly versatile. After browning the chicken sausage, there wasn’t any amount of fat left in the pan. Perfect for this nourishing pot of soup. I love big carrot coin slices in chicken soup. It reminds me of Mom’s homemade chicken noodle soup, the best in the world. 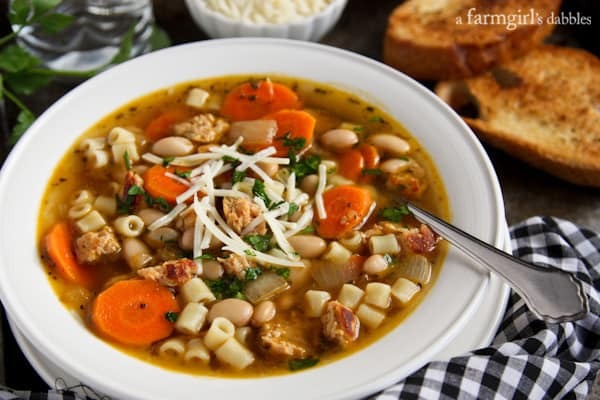 Add to the carrots some white beans and fun little tubes of ditalini pasta, and you have yourself one delicious pot of hearty and healthy Italian chicken sausage soup. Cook ditalini in salted water just until al dente, according to package directions. Drain and set aside. While pasta is cooking, heat olive oil over medium to medium-high heat in a large pot with a thick bottom. With a sharp knife, slice the chicken sausages lengthwise down one side; remove casings and discard. Add chicken meat to pot, breaking it up into smaller bite-size pieces, stirring every couple minutes. 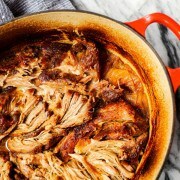 Once chicken is cooked through and nicely browned, remove it from the pot to a plate and set aside. To the same pot, over medium heat, add the butter and let it melt. Add the onion and carrots, stir, and sauté for 5 to 10 minutes. Stir regularly until onion and carrots are just softened. Add garlic and sauté for 2 more minutes. Pour in the wine and chicken stock, and bring to a boil. Lower heat to a simmer and stir in beans, white pepper, bay leaves, thyme, oregano, and basil. Then stir in the soy sauce and kosher salt, starting with the lesser amounts. You can always add more later if the soup needs more salt. Add cooked chicken sausage, cover the pot, and let simmer over medium-low heat for 30 minutes. Taste for flavor, adding more soy sauce and/or salt and pepper if needed. To serve, place a large spoon of cooked ditalini pasta in the bottom of a bowl. Pour hot soup over the pasta. Garnish with fresh parsley and Parmesan cheese. If you think you will eat all the soup in one meal, just add the pasta to the pot of soup and let it warm up a couple minutes before serving. Keeping the pasta separate ensures that it will not get overcooked and mushy. 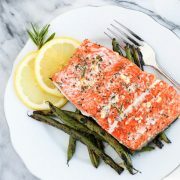 Connect with Gold’n Plump on their website, Facebook, Twitter, and Pinterest. This post is sponsored by Gold’n Plump, a local chicken brand based out of St. Cloud, Minnesota. The brand’s Good Chicken Mission centers on providing truly all natural products that are highly trimmed of fat and free of unwanted solutions. GNP Company, the company behind the Gold’n Plump brand, employs about 1,600 people and partners with nearly 350 family farmers in Minnesota and Wisconsin. I am partnering with them this year to bring you delicious new chicken recipes from our kitchen and backyard grills. Thank you for supporting the brands that I carefully choose to work with, that help make this site possible! All opinions are 100% my own, as always. That’s wonderful to hear! Thank you so much for coming back to let me know. Can you use regular pork sausages in this? Chicken and turkey sausage do not exist in the UK! Yes, I think pork sausage would be very good in this! It is not italian recipe!!!!!!!!!!!!!! Hi Liz – return the chicken sausage back to the pot right before simmering at the end. Tried this recipe yesterday since it was so cold and windy here in MO. I couldn’t find chicken sausage so I went with turkey sausage. It was still delicious! My husband really enjoyed it. Thanks again! Hello Barb – thank you so much for coming back to let me know. I’m so glad you liked it! I’m making this tonight. I can’t wait, it looks so delicious and it’s perfect for a cold snowy night here in NJ. Im with you on not being ready for such cold temps and snow yet! But if it must come, I can at least enjoy delish soups like this that warm me right up! Yum! My family would love this soup. I love that you used chicken sausage in this, sounds amazing! Thanks, Amanda. Happy Thanksgiving to you and yours! 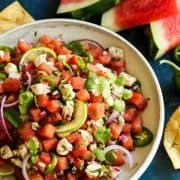 I am wanting a bowl of this right now, it looks excellent! I could eat this every night! Especially with how cold it’s been outside lately. Looks good! This looks so good! I’ve been on such a soup kick lately! Oh my goodness in regard to your weather. We had a week of low temps in the upper 20’s, but otherwise that’s it for cold. I am going to take a moment and count my blessing. I love this kind of soup year round. But it sure extra wonderful during the colder times. It sure is! Happy Thanksgiving to you, Carol! I hope you can find it, too! Happy Thanksgiving to you, Donna! Thank you Brenda for the nice soup recipe. You’re welcome, Liz. Happy Thanksgiving to you – thank you for always reading a farmgirl’s dabbles! Nice recipe Brenda for the cold weather months ahead. I won’t complain based on what Buffalo got!!! This will bbe dinner for the day before Thanksgiving. If we can wait that long!! Yes, there are always blessings to be counted, no matter the situation! Happy Thanksgiving to you, Wendy! It is FREEZING here too, so I’ve been on a total soup kick. Flavored chicken sausage is one of my favorite healthy ways to beef (er, chicken?) up a meal, so this looks perfect for us! This is definitely going on my must-make list – so warm and comforting. It doesn’t get much better than this, Brenda! definitely a belly warmer for cold nights – like tonight! I just want to reach in an grab a spoon Brenda!! This is exactly the kind of dinner I have been craving. I know my boys would love it! Tell me about it – winter did not mess around this year!! Hope you’re staying warm!